I’ve been wanting to try kohlrabi for a while now, aware of its pretty presence in the produce isle. I finally got around to it this week. No searching required, it was right there in front of me at the store, waiting. For those who have never tried it, kohlrabi is a mild tasting crunchy vegetable, a sort of cross between a cabbage and turnip in taste. I’ve also been on the lookout for purple kohlrabi, which is amazing in its colour, but no luck so far. It works well raw in salads or roasted/steamed for a side dish. Very low in calories and rich in nutrients, a perfect gift of nature. 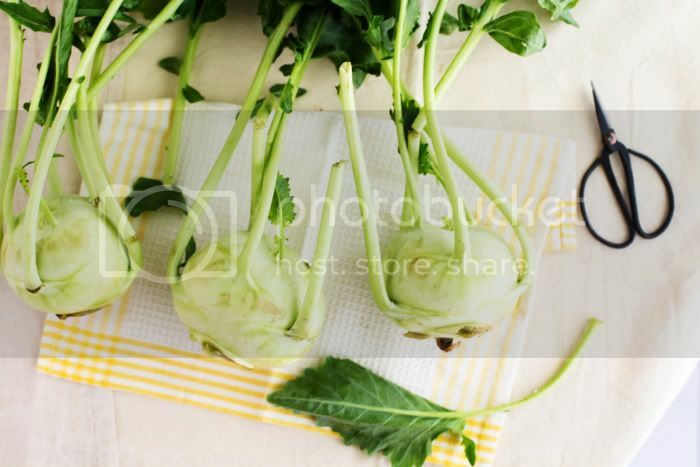 Look for smaller kohlrabi, about apple sized – they tend to be the juiciest. Don’t throw away the leaves, utilize them – chopped and quickly roasted with garlic, sauteed, or added raw to your salad, morning juice or green smoothie. In this salad, the crunch of kohlrabi, apple, and summer root veggies combines nicely with the creaminess of avocado and the sunny taste of citrus dressing. It would work well both as a side dish or a light meal, if adjusted to a bigger portion. 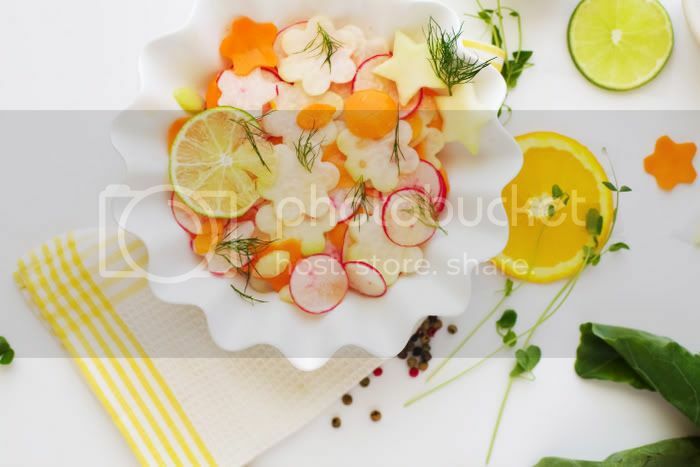 Thinly slice the kohlrabi, radishes, carrot, and apple using a mandolin or sharp knife. Alternatively, shred everything and place into a bowl. In a separate bowl, combine lime and orange juices with the oils, salt, and pepper and pour the dressing over vegetables. Let sit for 30 minutes to an hour at room temperature. Serve with avocado slices, sprinkled with walnuts and garnished with herbs. This is, by far, one of my favorite blogs. Beautiful presentation and photos! This salad sounds lovely. I will probably add some chayote, too! What a gorgeous recipe! I’m not sure I’ve ever tried kohlrabi, but your post is inspiring me to pick some up the next time I’m grocery shopping. i love your photos! they’re so bright and fresh! this sounds like a great salad! i have purple one in my garden but the inside is the same colour as in the green one. I love kohlrabi’s and grew up eating them just raw and plain. Thank you for the awesome recipe idea! We also enjoy kohlrabi from the garden. And as the previous anonymus I have been chewing on it since my childhood too. The photos reflecting such a real summer mood :) .. The presentation is amazing, and flavors sound really yummy. Love kohlrabi. What a funny name for what we call “chou-rave”, meaning “cabbage-rave”. Translations on their way! How do you get the little flower veggy cutouts? is it like a cookie cutter? So pretty! 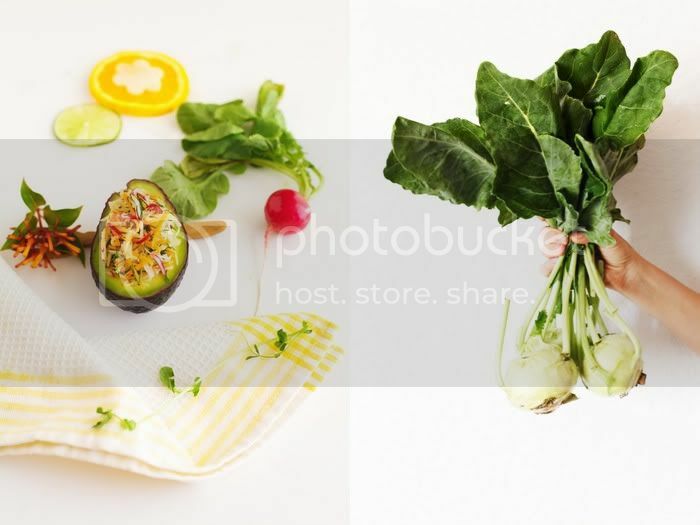 Your photography and whole love towards nourishing,whole,beautiful,natural foods is so inspiring! I have Candida so I can’t have a lot of the fruit and nut things you post,but yours is definitely one of the most beautiful and pure blogs out there! If you get a chance,could you possibly post a Candida safe recipe (no fruits,nuts,grains,sweeteners) in the future? I want to make a mini pumpkin tart for my birthday,can only have 3 or 4 bites b/c of the starch content. Thank you and keep up the beautiful inspiration! Very cool! I discovered kohlrabi in the past few months, when I started to explore Slovenian cooking and found recipes for kohlrabi in some 1950s Slovenian American cookbooks. Thanks for introducing me to Kohlrabi! Love the taste and versatility. Your photos, recipes and the overall feel of the blog is so warm and wonderful. When are you going to put out a book!?! This sounds delicious! I think not enough people know about kohlrabi! Your salads are always so lovely, almost too pretty to eat…but I would devour this :)! 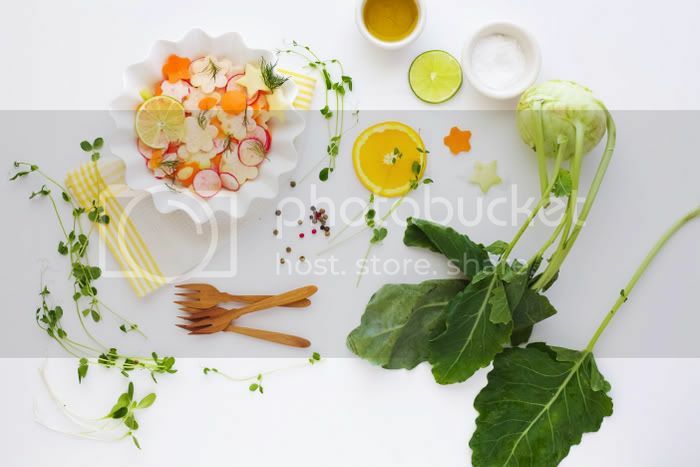 Gorgeous, gorgeous pictures and I would totally dig that salad! Angie, mmm chayote, great idea. Anon 3:14, wow I had no idea! Good to know. Erica, welcome and thank you. Jamie, precisely! Small cookie cutters, inspired by a Japanese restaurant we went to in San Francisco. Tajna, thank you for your comment. I’ll keep in mind Candida safe recipes for the future. Best of luck! Marina, welcome and thank you. I strolled past kohlrabi at the grocery this morning and stopped to look at it because I had never heard of it before! After seeing this recipe, I’m definitely buying some next time I’m at the store!! I’m so excited to try something new :) Thanks for the recipe! I love kholrabi salad – so tasty with grilled mackarel!